Issue number 5 in Volume 47 (2017) of the journal has gone to print and is available electronically. It is available at the publisher’s site. This is the first time that JCA has published 5 issues in a year. New Perspectives on Malaysia and a Rising China: Essays Honouring Lee Poh Ping (DOI: 10.1080/00472336.2017.1362829) by Kevin Hewison and Siew Yean Tham. From Patrimonialism to Profit: The Changing Flow of Funds from the Chinese in Malaysia to China (DOI: 10.1080/00472336.2017.1347696) by Kee Cheok Cheong, Poh Ping Lee and Kam Hing Lee. Dynamics of Trade in Value-Added in “Factory Asia” (DOI: 10.1080/00472336.2017.1322628) by Andrew Kam Jia Yi. Examining the Shift to Services: Malaysia and China Compared (DOI: 10.1080/00472336.2017.1310273) by Siew Yean Tham. Huawei and ZTE in Malaysia: The Localisation of Chinese Transnational Enterprises (DOI: 10.1080/00472336.2017.1346697) by Ran Li and Kee-Cheok Cheong. Navigating a Highly Protected Market: China’s Chery Automobile in Malaysia (DOI: 10.1080/00472336.2017.1345000) by Miao Zhang, Rajah Rasiah and John Kean Yew Lee. 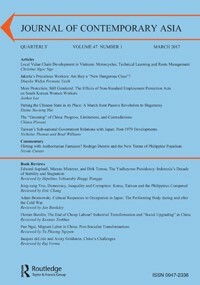 Diversity of Southeast Asian Capitalisms: Evolving State-Business Relations in Malaysia (DOI: 10.1080/00472336.2017.1322629) by Edmund Terence Gomez and Elsa Lafaye De Micheaux. Chinese Nationalism and Trust in East Asia (DOI: 10.1080/00472336.2017.1322627) by Qin Pang and Nicholas Thomas. The Global Rise of China reviewed by Kosmas Tsokhas. China’s Future reviewed by Kevin Hewison. The South China Sea: A Crucible of Regional Cooperation or Conflict-Making Sovereignty Claims? reviewed by Laura Southgate. Man or Monster? The Trial of a Khmer Rouge Torturer reviewed by Geoffrey C. Gunn. Coalitions of the Well-Being: How Electoral Rules and Ethnic Politics Shape Health Policy in Developing Countries reviewed by Joseph Harris. This entry was posted in Uncategorized and tagged Andrew Jia Yi Kam, China, East Asia, Edmund Terence Gomez, Elsa Lafaye De Micheaux, Geoffrey Gunn, John Kean Yew Lee, Kam Hing Lee, Kee Cheok Cheong, Kevin Hewison, Kosmas Tsokhas, Laura Southgate, Lee Poh Ping, Malaysia, Miao Zhang, Nicholas Thomas, Poh Ping Lee, Qin Pang, Rajah Rasiah, Siew Yean Tham, Southeast Asia. Bookmark the permalink.